Library image #4028: Looking down river at the lower part of the Sturgeon River falls. The United States Congress designated the Sturgeon River Gorge Wilderness (map) in 1987 and it now has a total of 16,744 acres. All of this wilderness is located in Michigan and is managed by the Forest Service. 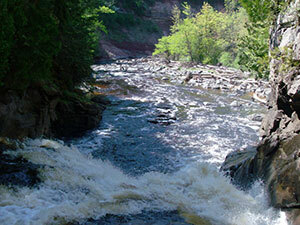 The Wild and Scenic Sturgeon River rushes out of the northern portion of this Wilderness, over the 20-foot volcanic outcropping of Sturgeon Falls, and through a gorge that reaches 300 feet in depth and a mile in width. Throughout this rugged, steep Wilderness, the Sturgeon and Little Silver Rivers and their tributaries have carved falls, rapids, ponds, oxbows, and terraces. Stunning views are possible from the eastern rim of the gorge. Except for a few naturally bare slopes, most of the land is forested with pine, hemlock, aspen, sugar maple, birch, and basswood. When the leaves of the hardwoods change color in fall, they form a vivid tapestry. On a trek through here you might see deer, bears, mink, otters, beavers, skunks, and foxes. Woodcocks and ruffed grouse are common, and bald eagles and ospreys are seen on occasion. Streams do not produce many trout, and the endangered lake sturgeon finds habitat farther downriver. There are few established trails in Sturgeon River Gorge Wilderness, and a few overgrown logging roads are hard to find and follow. The North Country National Scenic Trail parallels the northern and eastern boundaries for about eight miles. Sturgeon River Campground offers nine sites on the southeastern boundary. In spring and during peak runoff, kayaking and white-water canoeing are challenging, and only recommended for advanced paddlers. Planning to Visit the Sturgeon River Gorge Wilderness? How to follow the seven standard Leave No Trace principles differs in different parts of the country (desert vs. Rocky Mountains). Click on any of the principles listed below to learn more about how they apply in the Sturgeon River Gorge Wilderness.